With the Magnus ED telescopes gazing at planets, galaxies and nebulae in the night sky or viewing Earth's natural wonders has never been easier or more enjoyable. 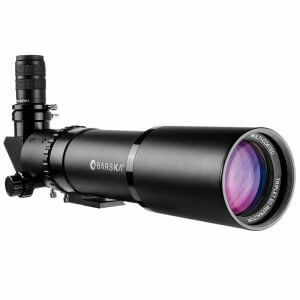 The Magnus 65ED and 80ED apochromatic telescopes are ideal for crisp wide field observing and imaging. The Magnus?s objective lens is made from premium ED glass (Extra Low Dispersion) and is virtually free of chromatic aberration (also known as color fringing). The fully multi-coated ED triplet optical design achieves a very small change in refractive index with different wavelengths of light. In short, you get crisp, high resolution images that are distortion-free. Select one of the included Pl? 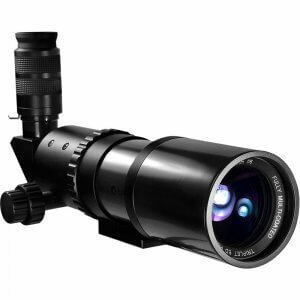 eyepieces, insert it into the included erect image diagonal, find an object to view and bring it into focus with the Magnus's precise crayford focuser. Magnus scopes include everything you need to begin your viewing adventure. To protect your investment, each component of the Magnus scope kit can be stored in the included deluxe foam-lined hard carrying case. BARSKA's Professional Tripod (available as an optional accessory) is the perfect stable platform to mount your Magnus telescope on to.